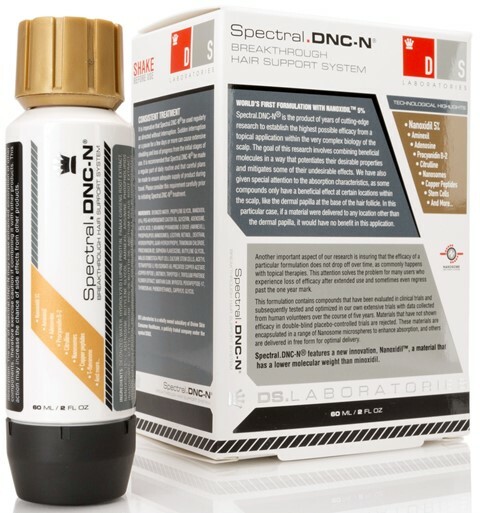 Spectral DNC ® is a new breakthrough topical hair loss treatment designed for androgenic alopecia and other types of hair loss in men. It incorporates Aminexil a new, breakthrough compound which is the only other molecule aside from Minoxidil that is clinically proven to promote hair growth. Clinically proven to stop male hair loss and promote hair growth on the entire scalp. 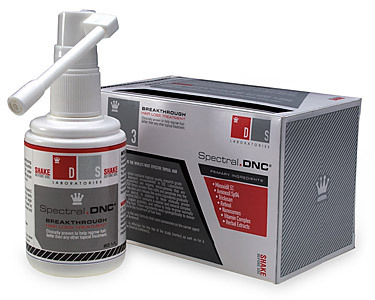 Spectral.DNC-N is the latest advance from DS Laboratories designed to surpass the limitations of minoxidil therapy. The first treatment to utilize Nanoxidil. (Size - 60mL / 2oz). DEIONIZED WATER, HYDROLYZED LUPINE PROTEIN, PANAX GINSENG ROOT EXTRACT, NANOXIDIL (5%), ADENOSINE, BUTYLENE GLYCOL, AMINEXIL, ARGININE, PHOSPHOLIPIDS (NANOSOMES), ACETYL TYROSINE, PPG-26-BUTETH-26, ARCTIUM MAJUS ROOT EXTRACT, HYDROLYZED SOY PROTEIN, PROCYANIDIN B2, POLYQUATERNIUM-11, PEG-40 HYDROGENATED CASTOR OIL, PEG 12 DIMETHICONE, CETRIMONIUM CHLORIDE, CALCIUM PANTOTHENATE, APIGENIN, ETHANOL, ISOLAURETH-6, ZINC GLUCONATE, TAURINE, PREZATIDE COPPER ACETATE (COPPER PEPTIDE), NIACINAMIDE, OLEANOLIC ACID, ORNITHINE HCL, CITRULLINE, RETINOL, GLUCOSAMINE HCL, PROPYLENE GLYCOL, PEG-8 DIMETHICONE, T-FLAVANONE, BIOTINOYL TRIPEPTIDE, BIOTIN, DIMETHICONOL, SILICONE QUATERNIUM-2 PANTHENOL SUCCINATECONE QUATERNIUM-2 PANTHENOL SUCCINATE. Spectral DNC contains strong vasodilator compounds increasing the absorption of Minoxidil and some people may experience a higher sensitivity to Minoxidil side effects. You should not use Spectral DNC if you have low blood pressure or are taking blood pressure lowering medications. People with heart failure or significant coronary heart disease should avoid Spectral DNC® because of these side effects. The most common side effects are redness and irritation of the scalp. Pregnancy: Spectral DNC® should not be used in pregnancy and by nursing women.